Is a poet and journalist. Born in 1962 in Voronezh, a town in Central Russia, she is a graduate of the Voronezh Medical Institute and the Voronezh State University where she majored in linguistics. Fanailova has worked as a doctor and as a university teacher. In 1995 she started her career in journalism joining Radio Liberty. Fanailova’s poems have been published in leading literary magazines in Russia and abroad. They are also featured in The Anthology of Contemporary Russian Women Poets (University of Iowa Press, 2005), Crossing Centuries: the New Generation of Russian Poetry (Talisman House Publishers, 2000), and Contemporary Russian Poetry: An Anthology (Dalkey Archive Press, 2008). 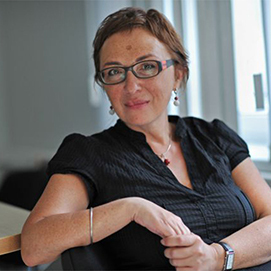 Fanailova is the author of four books and a winner of the Andrey Bely Award (1999) and the Moscow Score Award (2003). In 2008, a book of Fanailova's poetry entitled The Russian Version, translated into English by Stephanie Sandler and Genya Turovskaya, was published in the United States by Ugly Duckling Presse. In 2010, The Russian Version won the Best Translated Book Award for Poetry.